MainMan and I discovered Beaufort last summer, shortly after we’d moved cross-country from Los Angeles to South Carolina. I needed an ocean fix and I started researching small coastal towns within a few hours from us. I’m a total sucker for every listicle that’s ever been published on the country’s best small towns. 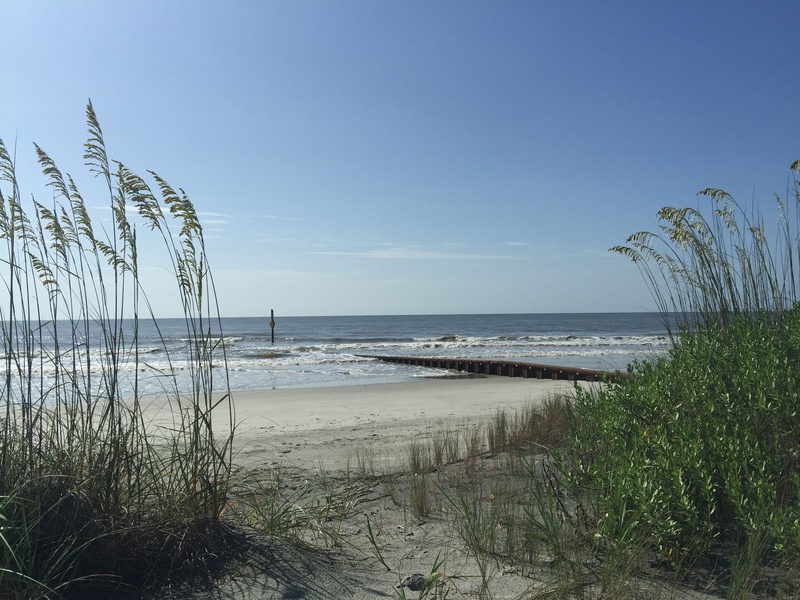 We had several magazines on getting to know South Carolina and they all listed Beaufort as a small coastal gem. When I read “Forrest Gump” was filmed in the area I shrieked with excitement and knew we’d found our weekend destination. I just discovered “The Big Chill” and “Prince of Tides” were also filmed there. My parents came down for the July 4 weekend and we decided to revisit Beaufort. With two weekends under our belt, I can now navigate people to some of our favorite spots in and around the charming riverside town. 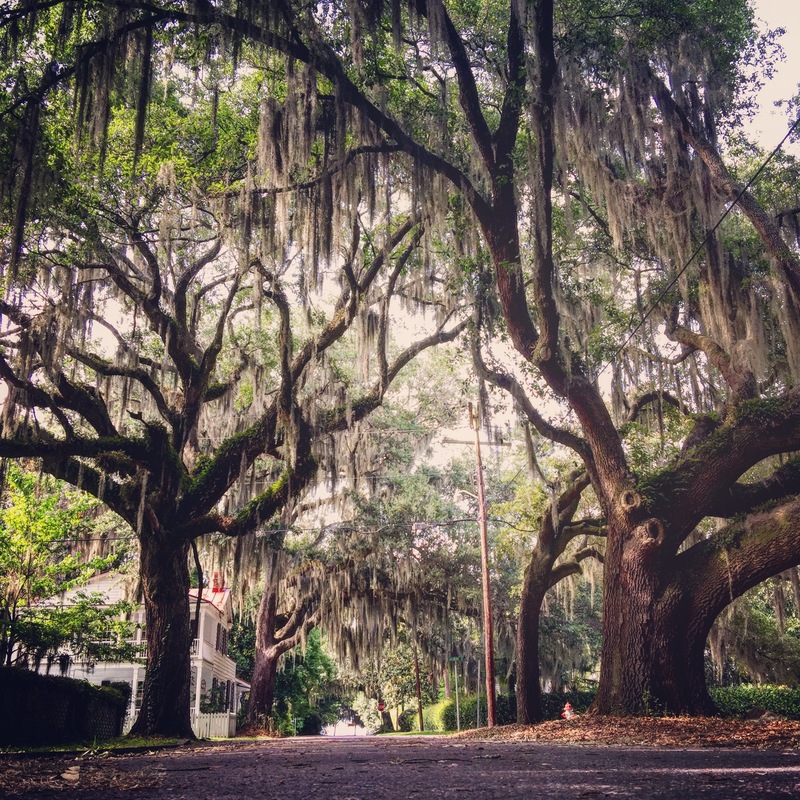 Beaufort is nestled in between Charleston to the north and Hilton Head and Savannah to the south. It’s not a beach town, though once there you’re surrounded by waterways. The town’s center is a backwards L consisting of two “main” drags. And that’s it. Bay Street is the main street. 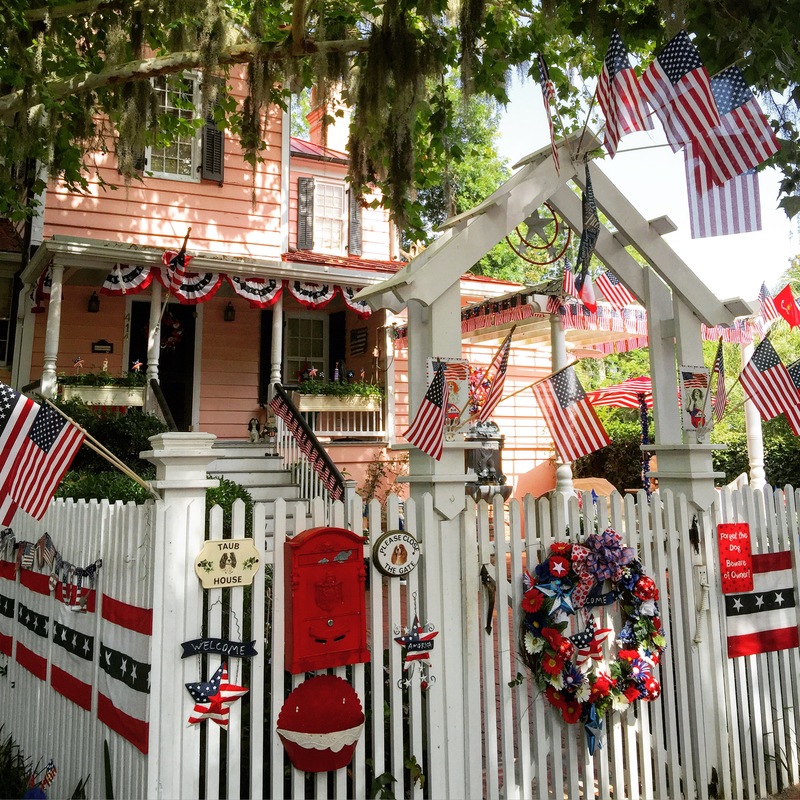 Towards the northwest end of the street you’ll find beautiful waterfront homes and inns, continuing onto the historic downtown area with souvenir shops, Southern clothing stores (Yeti-palooza) and restaurants. 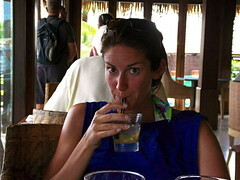 We had fruity drinks and snacks at the U-bar in Luther’s last year. It’s a fun dive bar with lots of dark wood and nautical decor. July 4 weekend my parents took us to Plum’s, which is right next to Luther’s. It’s not as heavy on the atmosphere as Luther’s, but the food’s better. I had a shrimp salad po’ boy which was delightful. I was worried it’d be too mayo-y, but the consistency was great, the shrimp was very fresh and the dill gave it some added flavor. My dad noted the bread was terrific, too. Indeed. Look at that fresh baguette. I can’t wait to try and recreate this sandwich at home. The backside of the restaurants on Bay Street overlook the Henry C. Chambers Waterfront Park and the Harbor River. At the end of Bay Street, at the intersection of Bay and Carteret, is a cute emporium called Fordham Market with a lot of different booths and vendors. It’s worth hopping inside to wander and escape the heat. Inside you’ll find all kinds of mementos including dozens of Tervis cups, hammocks and paintings of the sea and all its inhabitants. Stroll across Carteret/Rt. 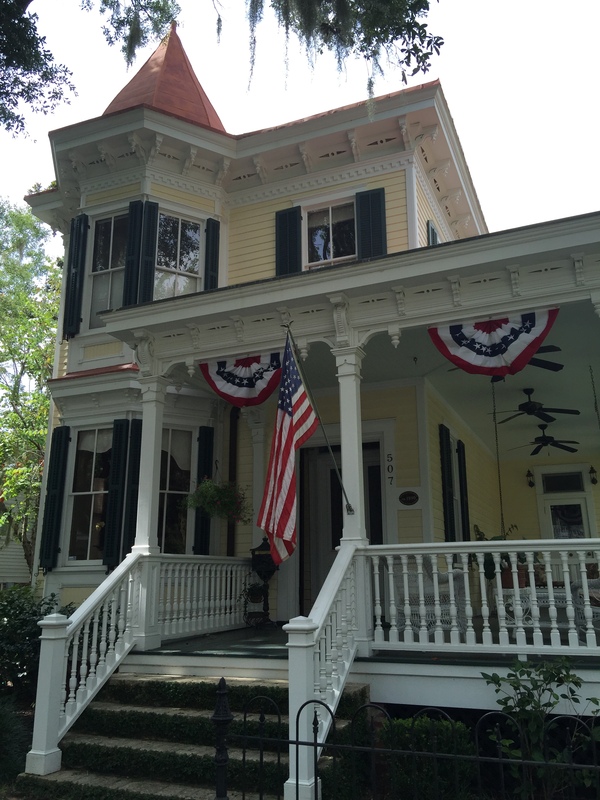 21 and you’ll find charming homes, of the Southern and Victorian variety, most with picturesque wraparound porches, creaky ceiling fans and big shutters. Below was one of my favorites. Not only is it yellow, but it had a red roof! I’m obsessed with homes with red rooftops. While driving around the area known as The Point, we found this pink patriotic explosion. Somebody got a little flag happy. There is a courtyard called The Green in between some of the opulent waterfront mansions that’s surrounded by live oaks and Spanish moss. I don’t know how one grows on the other, but it’s such an iconic representation of the lowcountry and my parents couldn’t get enough of this scene, nor could we. I have been talking about taking a painting class and I think I’m going to try and start painting some of my photos from this weekend, particularly the one below. A few other spots worth mentioning before we continue: there’s a charming antique store at the far western end of Bay Street, called Bay Street Treasures. They have all kinds of outdoor furniture and knick-knacks you can see from the sidewalk. Go in and take a few minutes to explore their neat space. 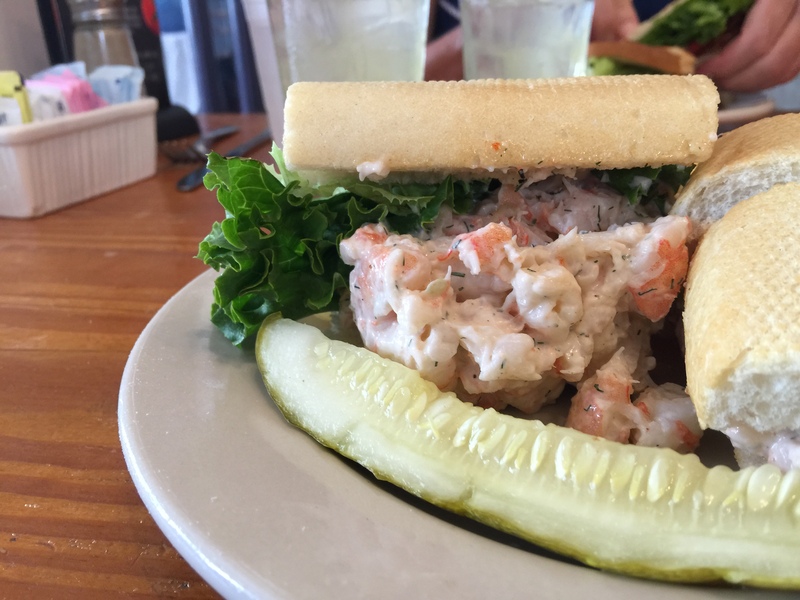 If you’re on the road and in need of a quick coffee or sandwich break, try Lowcountry Produce and Market Cafe on Carteret. They have all kinds of fresh food you can order from the counter, in addition to some gourmet local spreads, snacks and gifts. Further up Carteret, as you make your way out of town and right before the road turns sharply to the left, is Magnolia Bakery Cafe. And no, it’s not linked to the famed New York cupcakery. It’s a one-of-its-kind, mom-and-pop shop. 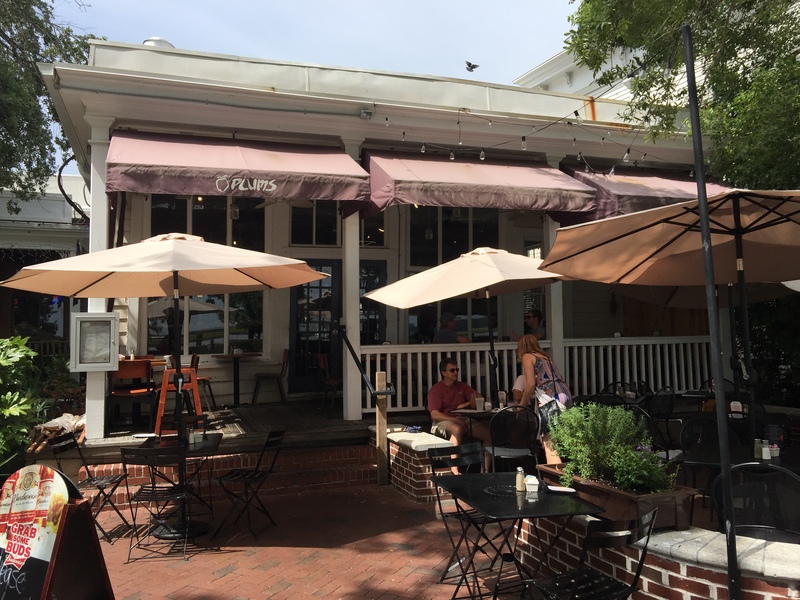 We grabbed a sit-down breakfast on the way out of town last year (great egg dishes), and this last visit we picked up croissants and scones on our way to Hunting Island State Park. We were there right when they opened Sunday morning at 8 a.m. and the selection was not great. Luckily they had a tray of fresh croissants and scones (though my mom was surprised when she bit into the scone it was stone cold, possibly just thawed from the freezer or fridge). Best to give them an hour or two to fill up their shelves with some of their tasty baked goods. The croissants were fabulous though. After cruising around Beaufort for a couple of hours on Saturday, we had to return to the hotel to check in on our pets. Which brings me to the lodging portion of this post. Do not, I REPEAT, do NOT stay where we stayed. We booked a room at the Days Inn in Port Royal, about eight minutes south of Beaufort. It was a total disaster. Check-in time was super late, and when we arrived right around the check-in time, they barely had rooms ready for us. We had to beg the lazy front desk attendant to consult with the maids to see which rooms were ready. It was bizarre. One of the rooms, designated as a “pet room,” reeked of smoke and it wasn’t even a smoking room. Sheets and comforters had cigarette holes in them, all the way down to the mattresses. The bathroom, while mostly clean, was just old and nasty. I barely wanted to sit on the toilet. And another really bad gross sign, my dog could not stop sniffing the beds, which made me believe they hadn’t been washed in a decade. I was embarrassed to have my parents stay in this place. I have since left terrible reviews everywhere I could find of this poor excuse for a hotel… They could use a visit from Gordon Ramsay. I’m nominating them to appear in the first episode of “Hotel Nightmares,” unless the show already exists. We had planned on walking Agnes along the Sands boardwalk in Port Royal Saturday evening, but we missed our opportunity. By the time we arrived, they had closed the parking lot for fireworks. And when we tried to go somewhere else for a stroll, it started raining and thundering ferociously, so we sat it out in the car and played “Heads Up.” My parents were “Heads Up” virgins so the game got ridiculous real quick. I’d read about a great waterfront seafood place in Port Royal — 11th Street Dockside — but they didn’t take reservations. And on a holiday weekend this seemed a risky endeavor. My dad, however, stepped up to the plate and volunteered to put our name in and sit at the bar while we went back to the Dreary Inn, dropped Agnes off and showered and changed. Our plan worked out great. We returned to Dockside to find my dad happily reading his iPad and enjoying a beer. He probably wished we’d taken a little bit longer. We ordered a few drinks and by the time we had them in our hands, our name was called. We had a window seat, which was great, though it was connected to the closed-in deck area, and not overlooking the water. The folks at the deck tables got the water views. I ordered the steamed seafood pot. Check it out below. 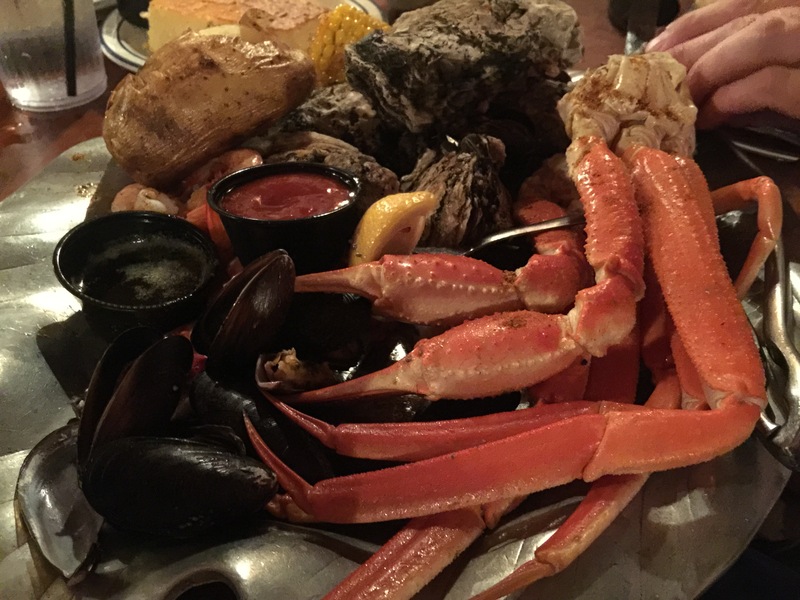 It was a ridiculous amount of food, but I really wanted to kick up the fun factor and I felt crab legs would do the trick. I wouldn’t recommend the oysters, they were the size of Shaquille O’Neal’s feet and they weren’t very flavorful. I prefer small oysters. MainMan had to shuck them at the table, which was a bit dangerous, but he survived with no injuries. Sunday morning I wanted to take everyone, including Agnes, to Hunting Island State Park. It’s a beautiful part of the state, with one of the most unique landscapes I’ve ever seen. It’s a densely packed tropical forest with every type/height of palm tree you can imagine. The beach is beautiful and dog-friendly, though it’s never been cool enough where we could spend a considerable amount of time there with Agnes. MainMan walked her for about 20-25 minutes along the water and that just about did her in. 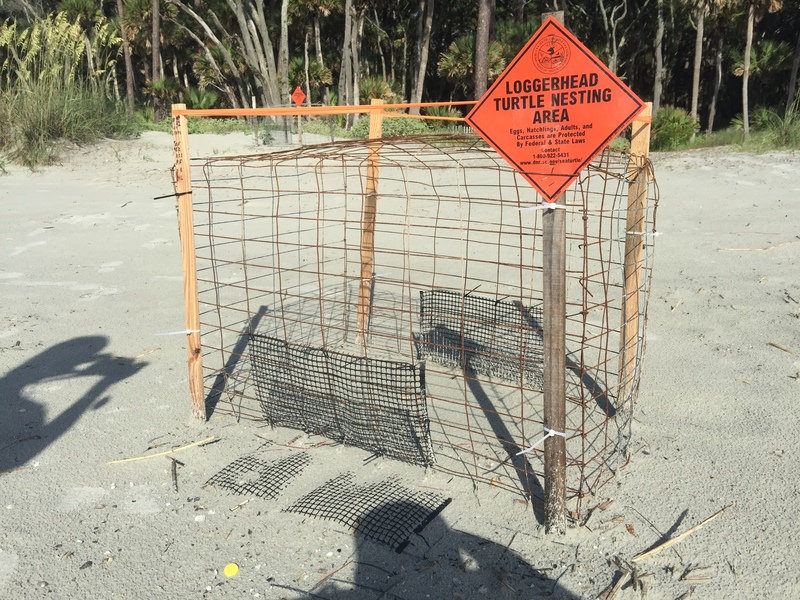 We spotted these small areas that were fenced off for nesting turtles. Very cool! 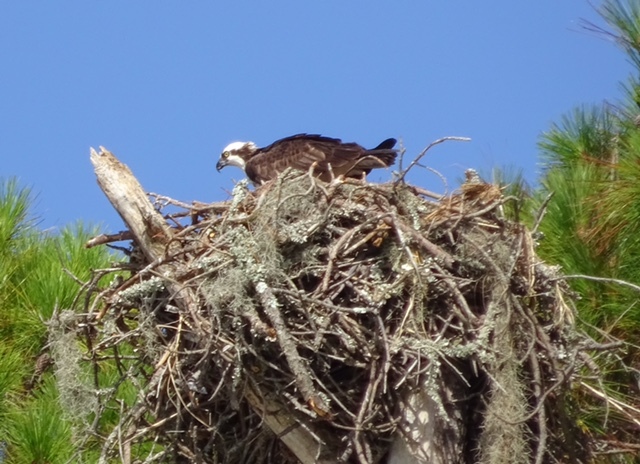 One of the highlights of the morning beach stroll, besides the ocean views, was discovering an osprey nest on top of a dead pine tree about 1/4 mile from where we parked our car. We all spent several minutes staring up at it and trying to figure out how many fledglings were in the massive nest. My mom took dozens of photos with her awesome fancy zoom camera. I took a couple, but nothing really came out with my iPhone. And my dad just sent me this beautiful photo he took. The park has trails, campsites (which we have yet to check out), beaches, lagoons and fishing areas. There’s a visitor’s center that I’d recommend you stop at on the way into the park. We made the mistake of trying to get to it on the way out and we drove around in circles for 15 minutes. Below is a beautiful shot, if I do say so myself, of the beach I took from the dunes. Take me back to this place! After the hour or so that we spent on Hunting Island, we drove over a bridge to Fripp Island, only to discover it’s a private island. Security turned us away at the gate. My mom read about a resort on the island, but other than that, we don’t know what’s going on there besides a bit more privacy. On our way back to town we stopped at the marsh boardwalk, a stone’s throw from the Hunting Island entrance. It was a quick walk to the end of the boardwalk, but it’s worth the 360-degree views of the marshes and birds. Here’s Agnes and I making our way through the marsh. 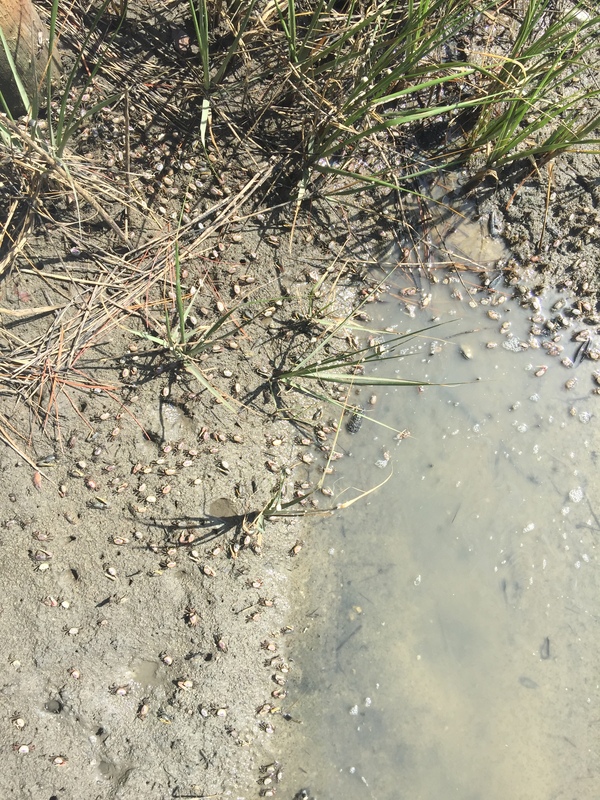 One of the wackiest things about this walk was seeing thousands of tiny crabs on either side of the walkway. They looked like big insects. They moved in unison in wavelike motions, with the occasional rogue crab raising its dominant claw like it was rallying the troops to battle. This is a silly photo I took to try and illustrate what they looked like. They were equal parts cool and creepy. We had one more stop to make before heading home and that was Gay Fish Company, to take some photos of the shrimp boats. I believe the scene where Forrest Gump jumps off the shrimp boat (that ultimately crashes) was filmed off this pier. 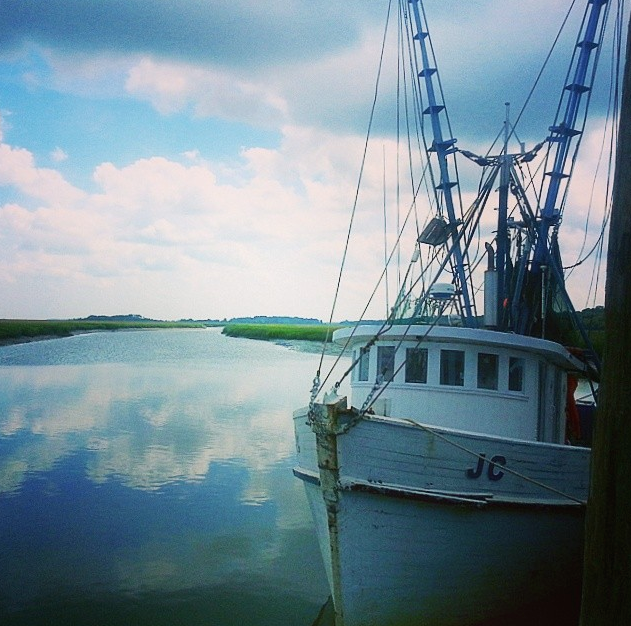 We read about a spot for lunch right by Gay Fish called The Shrimp Shack. It was closed on Sunday, much like everything else in town, so we put it on the list for next time. My mom said it best when she said, “This should definitely be your Carmel!” My parents have a home there and they always call it their happy place. Beaufort has quickly become one of my favorite places and I look forward to spending many more weekends there. Now we just have to find the right pet-friendly accommodations. I just found your blog – I am a native Californian (with stops in TX, MI and NJ) now living in Beaufort County. I enjoyed your travel log and especially I loved your mom’s quote about Beaufort being your Carmel! I was raised in the Monterey Bay area and I couldn’t agree more – the only thing missing is mountains and maybe some really good shopping! 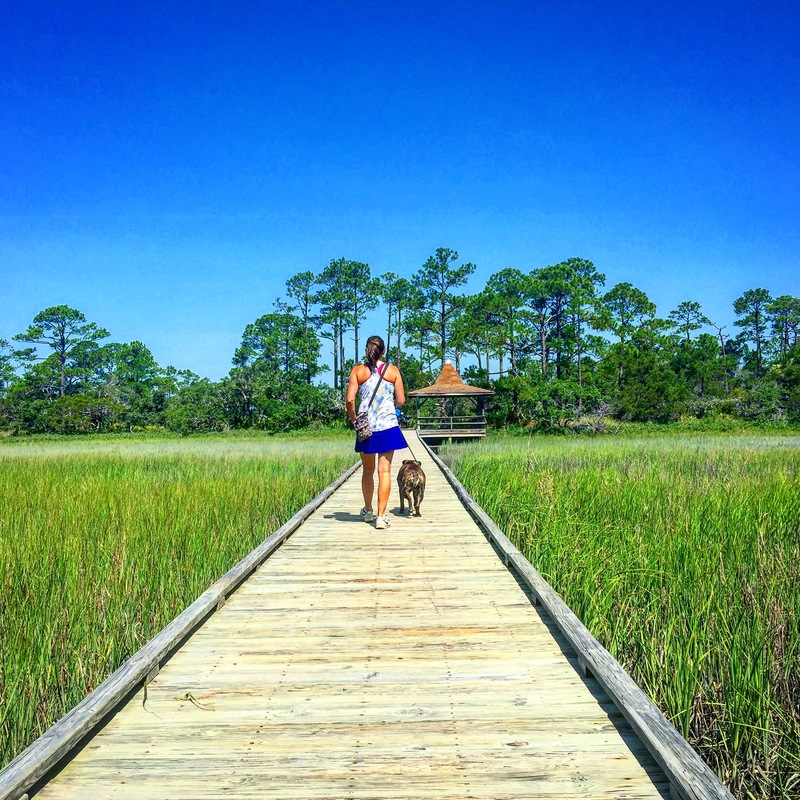 A couple of things – there are many pet friendly hotels in downtown Beaufort (The Beaufort Inn, City Loft, Rhett House Inn, Best Western). They can be a bit pricey during peak season and you will sometimes find promotions during non-peak times. I think most charge a pet fee. And those crabs you saw “waving” – they are male crabs trying to distinguish themselves to capture the attention of a lovely female crab! I look forward to reading more of your Southern experiences!